(For background on Rosetta and Philae, read this article I wrote for Jump! magazine). When Philae landed on comet Comet 67P/Churyumov-Gerasimenko in November 2014, things didn’t go as smoothly as the European Space Agency (ESA) had hoped. Not only did the lander bounce several times before it actually landed, it ended up quite a distance from its target destination. How great a distance we don’t yet know, because the Rosetta orbiter can’t find it. The trouble is that Philae is only about the size of a domestic washing machine, measuring just 1 metre across. Although the ESA has narrowed down its likely location to a strip measuring 30 metres by 350 metres, that still leaves a search area of 10,500 square metres. And while Rosetta is still orbiting the comet, its schedule was planned months ago and to change trajectory now would interfere with its planned observations and measurements of 67P. So the ESA is having to examine images like the one below in their attempts to locate Philae. 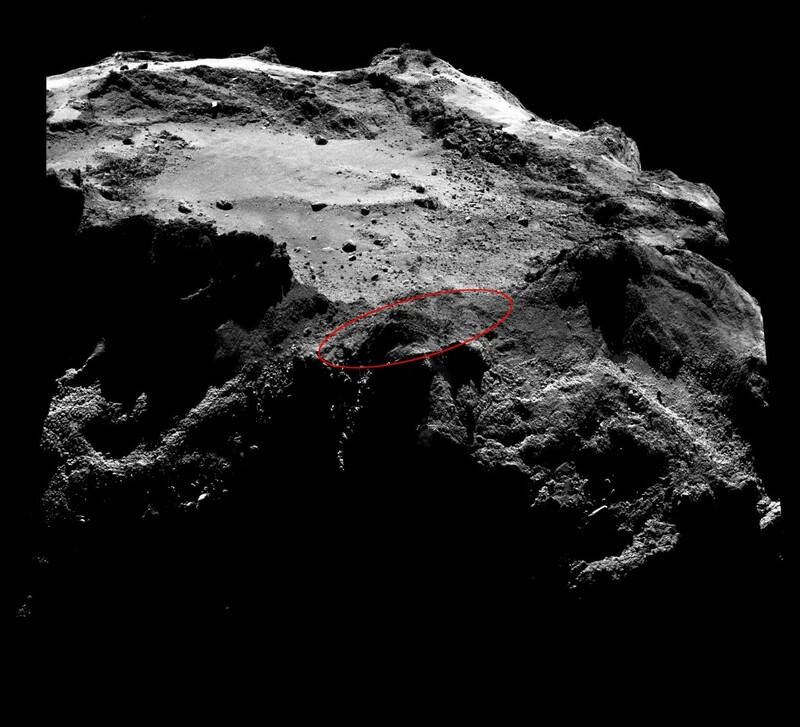 It was taken from a distance of about 20km, and if Philae is in the image it would be just 3 pixels across. Not only is Philae missing but wherever it has ended up will have far less exposure to sunlight than its planned landing site, which would have given Philae 6.5 hours of light every day (one day on 67P is 12.4 hours). If the lander is somewhere within the 10,500 square metre area being searched by the ESA, it’s likely to be getting just 1.3 hours of light per day. This means that although it might have enough power to wake up sometime in March it’s unlikely to be able to transmit until May or June, if at all. At least it was able to complete its initial scientific sequence during its descent and unexpected multiple landings!